Adalet CN Series of Increased Safety Control Enclosures are intended to house electrical equipment that will not generate an arc or spark during normal operation and in which surface temperatures are controlled below incendive values. Increased Safety ‘e’ enclosures take design measures to resist impact and prevent the possibility of excessive heat and the ingress of water or dust, thus preventing any explosions from occurring. 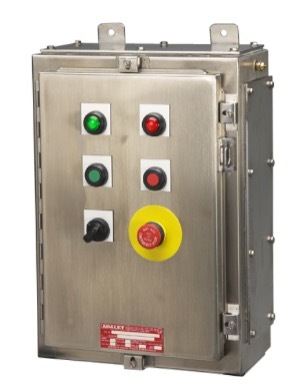 Adalet CN Series of Increased Safety Control Enclosures are available in stainless steel 316L and 304. Adalet can also supply custom-sized enclosures, operators and wiring of devices to rail-mounted terminal blocks for specific Increased Safety applications. Auxiliary devices include pilot lights, pushbuttons, mushroom head pushbuttons, emergency stop pushbuttons, selector switches, potentiometers, and measuring instruments. The CN Series is offered in sizes from 12”x24”x6” to 60”x36”x20”.